Moscow's Metro stations together amount to the most beautiful public transport facility in the world. 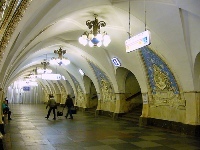 Visitors to Moscow should not miss taking a ride on this glorious underground rail system, and exploring the stations. Each one has its own, distinct aesthetic, variously adorned with Realist artworks, chandeliers, ornate pillars and marble floors. Moscow's Metro caters to something like two and half billion passenger rides per year, making it one of the busiest underground metro systems in the world. Despite this, the stations are more akin to palaces or five-star hotel lobbies rather than functional spaces. The depth of the elevators is also astounding. Most travellers will encounter the Metro system for practical reasons, but many will find that they choose to spend more time than necessary underground! There are nearly 200 stations but some of the most beautiful and ornate are Kiyevskaya, Dostoyevskaya, Prospekt Mira, Mayakovskaya and Ploschad Revolyutsii. Address: The Moscow Metro covers most of the city. Opening times: Daily 5:30am to 1am.